Ben Mendelsohn, who made waves with his portrayal of the villainous Director Orson Krennic in Star Wars: Rogue One, is reportedly in talks to play the Captain Marvel movie's villain. Variety reports that directors Anna Boden and Ryan Fleck have met with Mendelsohn (who worked with the pair before on Mississippi Grind) and the actor has decided to pursue the role of the film's big bad. Should he get the part, Mendelsohn would likely play a leader or distinct member of the Skrulls, a shapeshifting alien race that have been around since some of Marvel's earliest Fantastic Four comics. If you're wondering how Marvel can use something from the Fantastic Four while 20th Century Fox owns the movie rights, here's the breakdown: while the rights to some specific Skrull characters belong to Fox, the Skrull race as a whole is available to Marvel and Fox. Regardless of who he plays, I'm pretty confident Mendelsohn will be an exemplary bad guy. 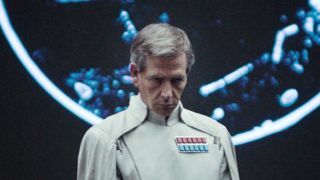 He's played or will play antagonists in movies like Robin Hood (The Sheriff of Nottingham), The Dark Knight (Daggett), Ready Player One (Nolan Sorrento), and the aforementioned Rogue One: A Star Wars Story (Director Krennic). He does well with those sorts of roles, and I'm down for watching him chew scenery as a straight-up supervillain. Most of the details regarding the Captain Marvel movie are still under wraps, but we know that Brie Larson will star as the titular heroine, and that it takes place during the '90s. Oh, and recently MCU boss Kevin Feige confirmed that Captain Marvel will have a role to play in the as-of-yet untitled Avengers 4.